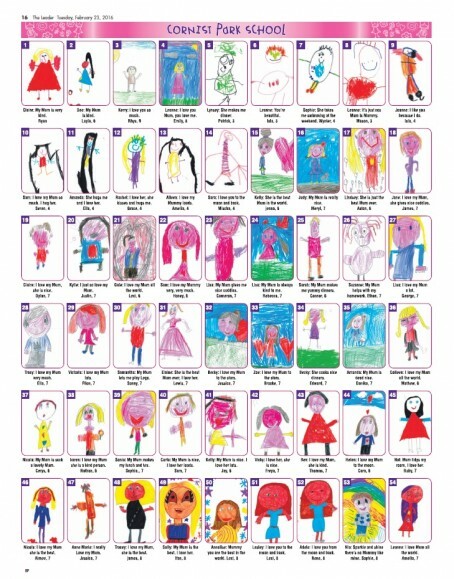 A regional publisher launched a “military style operation” to get more than 30,000 children’s drawings of their mums in print in time for Mother’s Day. NWN Media staff had to work round the clock in order to get the pictures published across its portfolio of regional newspapers, which includes three edition daily The Leader. Primary schools across North and Mid Wales, Chester and Shropshire took part in NWN’s ‘Draw Your Mum’ project, run annually in the run-up to Mothering Sunday. The record number of entries to the project, now in its seventh year, saw up to 54 drawings per page placed on a total of 664 pages for this week. Prior to that, all 30,000 drawings had to be sorted manually by area to ensure they were placed into the right newspaper. Paula Jones, ​NWN retail s​ales ​manager, spearheaded the project with the pages designed and prepared by the company’s production department. Said Paula: “This is the 7th year we’ve run ‘Draw Your Mum’ on the lead-up to Mother’s Day, and each year it just grows and grows. This could be the saving of uk regional press! Is this the best use of RGC ever? My father’s newsroom has many mansions…in other words, a newspaper should have something for everyone, so well done to NWNM. As a newspaper editor one Easter, I put a large blank oval in a quarter page space for a “paint-an-Easter Egg” comp and we had a brilliant response, although certainly not at the 30k level. At Christmas, a large isosceles triangle for a “Dress the Christmas tree” comp brought another massive entry. Moral of the story: remember the reader.